Sea—Air—Land—Tactical. 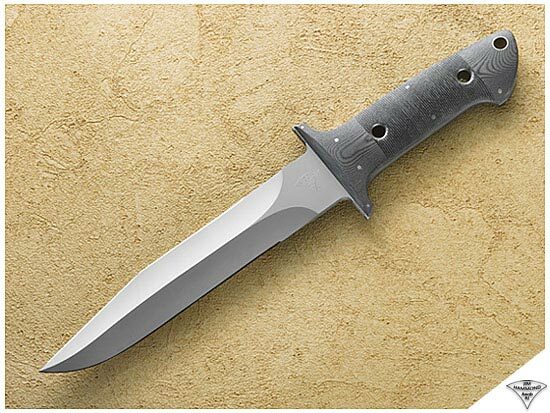 Before “Tactical” was even a faint blip on the horizon of the knife industry’s radar screen, the Hammond SEALTAC® was paving the way with special warfare personnel worldwide. Developed in 1981 with U.S. Navy Special Warfare (SEAL) personnel, continuing input of key design factors was received, evaluated and implemented as necessary design criteria for what they themselves considered to be a definitive fighting knife—one suitable for many tasks but primarily prepared as the finest weapon they could have if called upon to serve as their last line of defense. The Hammond SEALTAC® has earned the “combat seal of approval” as it enters its third decade of proven reliability with military personnel throughout the world, including the U.S. Navy SEALs, U.S. Navy Special Boat Units, U.S. Army Special Forces and Rangers, U.S. Marine Corps Force Recon, U.S. Air Force ParaRescuemen, British SAS, and a host of other units and undercover operatives around the globe. “Bells and Whistles” contribute absolutely nothing to the specialized makeup of the modern combat knife, and to the needs of its user. That’s why you won’t find them on any Hammond MV (military version) tactical/combat knife. The SEALTAC® has a fully double-ground blade that is sharpened on both top and bottom. The point is raised ¼” above the centerline, breaking the line of the spine at the start of the clip on the top of the blade, and curving into the point. This accomplishes three things: equally distributing support between the two edges; greatly increasing the mass at the blade tip; and allowing maximum cutting efficiency of both edges to be maintained. Though the point is slightly raised, it still tracks superbly along the axis of the thrust—in other words, it goes where you want it to go. The wide ricasso area ahead of the guard adds strength at the most highly stressed portion of the blade. The blade retains its ¼” thickness for virtually its entire length along the spine. The tang of the blade handle is fully tapered to .050” thickness for optimum balance and weight reduction.